Are you planning a trip to Munnar to enjoy its scenic nature and different tourist attractions? As you know, this hill station is famous for its large expanse of tea plantations. Around 50 tea estates are there in and around Munnar. In fact, the sprawling tea plantations in this tourist spot are the results of the challenges and adversities faced by a lot of people. The suitable climate is another reason for the growth and cultivation of tea in this hill station. Visit the Tata Tea Museum in Munnar to know the history of the growth of the tea industry in Munnar. Never forget to visit the famous Tata Tea Museum if you plan a trip to Munnar. It locates at the Kannan Deven Hill Plantation of Nallathanni. Each traveler should like to visit this ever first tea museum in the country. 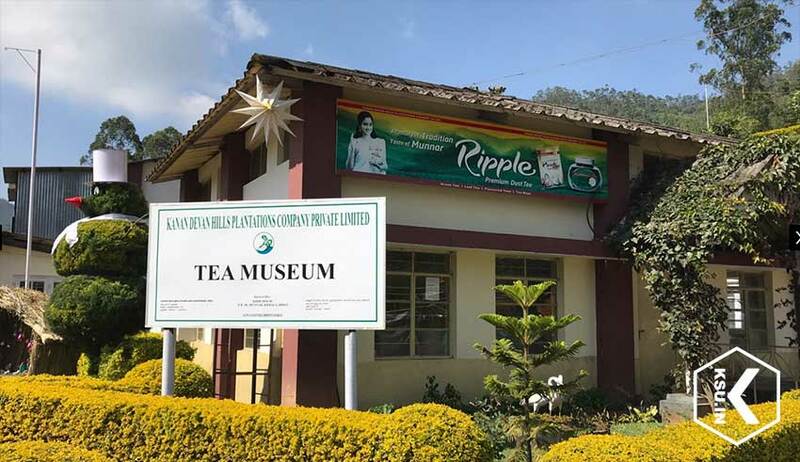 One must get a deep idea about the rich tea plantations and its history by visiting this museum. Whether you are tourist or a tea lover, you will love to pay a visit to this museum. You will not find any better way to know the flourishing and rich tea industry of Munnar than visiting the Tata Tea Museum. It houses several photographs, machineries and curios that illustrate the growth of the tea industry of the hill station. Besides, each traveler should get an idea about the efforts and rigors of the people who were behind the cultivation and growth of tea estates of Munnar. Some of the items at the Tea museum certainly catch the attention of visitors. Tourists love to see the ‘Rotorvane’, the original tea roller at this place. Dated back to 1905, this roller was used for the tea processing CTC type. The Pelton Wheel at the museum was in use in the power generation plant in 1920’s at Kanniamallay Estate. You can also see a rail engine wheel here which was belonging to the Kundala Valley railway. In addition to above items, the Tata Tea Museum houses elegant bungalow furniture, wooden bathtub, typewriters, manual calculators and iron oven. It is also interesting to see the EPABX of the telephone system of 1909 at this museum. We Taxi Kochi help you to visit Munnar and make an enjoyable trip to the Tata Tea Museum without any hassles. When you think of Munnar, the first thing that may come to your mind can be its large tea estates. It is exciting to watch beautiful hilly areas blanketed by large acres of tea gardens. Today, Munnar is a synonym to tea gardens. Your trip to this hill station will not be completed without taking a stroll through the rich tea plantations. You must also remember to taste and shop fresh tea during your trip to Munnar. Approximately an hour. If you want to attend a special show, it might take a little longer.